There are millions of unused domain names, but those domain names are not born for sitting idle, to stand out and get sold for a profitable outcome. Many of the domain investors and people new to the domaining industry have a domain Sale ‘Phobia’, how to sell my domain name fast? Here are the 5 unique ways to sell a domain name fast in 2019. Remember, no market will welcome you with dollars and offers, its all about how you research and market your domain names. Try new ways of selling your domain names like commenting on YouTube channel, telegram channels. Never think the market is dull, its all about your perception to make the sales done. Try to find the fresh market places rather than the old recognized ones. Market places like SEDO, Uni registry, Undeveloped, Flippa are very well known to domainers. Start searching for new domain marketplaces like Epic and Dnfinder. Go for active domain marketplaces but not for the well known. Its a known fact to most of the domainers, but still WHOIS details are hidden by many domain name owners believes that there could be some problems such as hacking or sending spam messages to their whois address. Making your whois data visible increases the probability of selling domain names. If some one interested in your domain name the first source is WHOIS address, but if you hide it its like a self goal. Some people have great domain names, but they fail mostly in dealing with the pricing factor. Either they quote they pricing their domain name high or present it with a number ending with zero. For example, Offering a domain name for 5000 USD and 4999 USD will make a big impact. The 99 fancy number is still the favorite trap for many domain buyer to get caught. Create an opportunity window instead of a welcome door. Many of the domain name owners either park their domain names or left them idle. Instead of doing that, giving a Domain for Sale message with contact details is the best way to sell a domain name fast. Hope these tips can help you in selling your domain name faster. 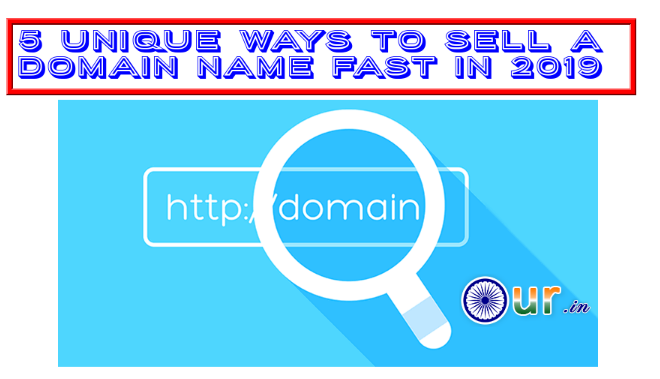 The post 5 Unique Ways to Sell a Domain Name Fast in 2019 appeared first on Its our.in India's Pride.